If you have been using blenders for a long time, then you know that Nutri Ninja and Nutribullet is very familiar and well-reviewed brand. From the beginning, they are working with high technology and skill for building the new models and updating the high-quality models. There are many high-quality and high-performance models of these two brands. So it will be challenging to you to find out the actual blender according to your actual needs. This Nutri Ninja vs Nutribullet comparison article will help you in all aspects of purchasing best blender according to your preferences and needs. As a single serve blender both brand’s model is so affordable. After reading this full Nutri Ninja Auto iq vs Nutribullet Pro 900 comparison article you can decide and fix actually which model you need. At first we can Compare between Nutri Ninja and Nutribullet for the power limit of the motor. If you are looking for best powerful blender, then power and speed have an issue in that case. Let’s see how much power and speed these two brands contain. In compare to power, Nutribullet has three power range. 600-watts base model, 900-watts mid-range model and 1700-watts Rx models. On the other side, Nutri Ninja has verities blender model depending on 1000-1500 watt power motor with the three-speed option. Nutribullet’s speed capability starts from 20000 RPMs and going up to 30000 RPMs for the top model. But, for Nutri Ninja brands you will get maximum speed 24000 RPMs. 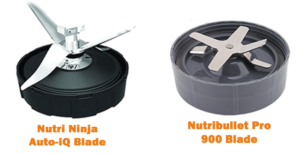 The blade comparison between Nutri Ninja and Nutribullet, it is more complicated and confusing when it comes to the blade parts. But, it’s not like that much as you think. If you look Nutribullet contains 6 blade technology where ninja has 4 blades. And both are slightly sharp and powerful. But the most obvious difference is Nutri Ninja blades stands both to the top and bottom. Either Nutribullet blade stands two bottom and four tops. For that reason, it can easily blend top and bottom ingredients perfectly. The Nutribullet blade is easier to remove than Nutri Ninja. But, you have to be careful otherwise its sharp blade can cut your hands. Nutribullet pro 900 has been built with aluminum. The Dimension of Nutribullet pro 900 is 14 x 16.3 x 7.9 in, and weight is 11.4 pounds. On the other hand, Nutri Ninja auto iq has been built of plastic. The Dimension of it is 6 x 6 x 15.5 in, and weight is 7.4 pounds. Nutribullet has come with 32 oz cups and, Nutri Ninja has come with 24 oz cups but can handle 32oz. Both are personal blender so, blend capacity is a more important thing. You can choose your Blender according to your needs. Which one has more liquid capacity? the Extractor blades are sharper of Nutri Ninja Auto iq than other personal blenders. It had built 1000 Watt/1.2 HP motor. It can easily liquefy and make juice smoothly. Its RPM is 21,000. Also, Both of this blender is capable of pureeing, blend, grind and chop any vegetables, fruits and hard foods. Both of them have come with the powerful motor. The Extractor blades are sharper of Nutribullet than other high quality blenders. It had built 900 Watt/1.2 HP motor. It can easily grind and liquefy any ingredients. Its RPM is 25,000. Which one crushes Ice better? Blender needs enough power to crush ice smoothly. The Nutribullet machine can crush the ice cubes without any lumps. Nutri Ninja is also good for crushing ice cubes to a smooth consistency without any issue. If you look at the speed of these blenders, you can easily understand that which one is better for crushing ice in this comparison. You can also compare the power of motors. Which one is best for making smoothies? Nutri Ninja is more powerful than Nutribullet from the aspects of the power of motor but not powerful than Nutribullet from the aspects of RPM. So now it depends on your actual needs and the average of your daily use plan. On the other hand, Nutribullet Pro 900 can be called smoothie blender. Undoubtedly, it can be said smoothie blender because of its exclusive features and the performance of making smoothies. Many of the users and customers use it for making smoothies. You can see the NutriBullet Blender Series for getting more information. It’s now completely clear that both blenders are enough strongest according to the needs. There are many powerful blenders of the Ninja brand. We recommend Nutri Ninja Auto Iq blender. For single serving ninja auto iq is the best blender. It can easily grind softer kinds of natural ingredients. It’s also good and ideal blender for making smoothies, frozen recipes, dessert recipes and side dishes of Ninja brand. Nutribullet pro 900 is an Ideal blender according to customer satisfaction, its features and cheap rate. It receives daily lots of customer’s well reviews. We recommend Nutribullet pro 900 from its series for its features and cheap rate. As a single serve blender, its performance is so high. It is best for grinding and making Juice, Juice type smoothies, hard food (not so hard), soup and much more. The Nutri Ninja and Nutribullet blenders have great strength and power. They are very convenience and great value in price. It seems that best blender depends on your price and choice. The Nutribullet is better in looking, more compact and versatile with its reputation and reliability. And also it is an ideal choice for making hot dishes, dough, juice smoothies and other recipes. Although, Nutri Ninja is good for ice crushing and making smoothies smoothly but not better for smoothies than Nutribullet.